Lightweight unmanned aerial vehicles show their worth on small-scale photogrammetric projects and offer advantages over traditional aerial mapping and ground surveying. A Canadian company shows how. Based in Salmon Arm, British Columbia with offices in Alberta and Ontario, Accuas specializes in using lightweight unmanned aerial vehicles (UAV) to perform photogrammetric surveys of small sites. Since the company’s inception three years ago, it has flown a wide variety of jobs for a diverse range of clients, including consulting engineers, environmental consultants, and aggregate companies as well as local and provincial governments. The company has enjoyed success with this relatively new form of aerial mapping. For sites of 10 km2 (4 square miles) or less, UAV surveys represent a cost-effective alternative to traditional photogrammetric data collection methods. The ability to fly small areas at a relatively low cost allows aerial photogrammetry to be applied to many tasks traditionally performed by land surveyors, such as cut-and-fill analysis and volumetric survey. A typical UAV survey uses low-cost consumer-grade cameras for data collection. High spatial resolutions of around 5 cm are possible because typical flying heights are less than 300 m (1,000 feet), about a tenth the height of most manned photo collection missions. Over the last few years, lightweight UAVs weighing less than 4 kg (10 pounds) have been developed. These are similar to radio-control (RC) hobby aircraft but are typically designed to carry small payloads and operate semi-autonomously. Unlike the large UAVs used by the military, these platforms stay airborne typically for an hour or less and carry lightweight sensors such as digital cameras or thermal video cameras. UAVs differ from RC hobby aircraft in a few other ways. The aircraft follows a pre-programmed flight path, which is uploaded to an on-board auto-pilot. The flight plan guides the aircraft to a series of waypoints and determines when photographs are to be taken. Normally, the aircraft flight is remotely monitored on a laptop computer with the operator typically taking control only on takeoff and landing. Accuas currently uses several Outlander UAVs developed by Manitoba-based CropCam. This aircraft weighs around 2.7 kg (six pounds), with a 2.5-m (eight-foot) wingspan. It is capable of flying for about 45 minutes on a fully charged set of batteries. The aircraft carries a maximum payload of .4 kg (one pound), which necessitates using a compact camera for imaging. While these cameras are lightweight, the small sensor size and the fact that the lens is not fixed mean they have relatively poor image geometry and must be frequently recalibrated to achieve optimal results in the photogrammetric process. In addition to standard photogrammetric applications, the company also uses a custom-built near-infrared camera for carrying out projects relating to vegetation health. The information provided by this camera is useful for applications such as precision agriculture and monitoring drought stress. In the future it may be possible to incorporate additional sensors such as a miniature lidar for applications in densely forested areas. In addition to the low cost and relatively high spatial resolution, UAV surveys offer a number of other advantages. Due to the low flight ceiling, photographs can be obtained under overcast conditions and at relatively short notice. This makes it possible to obtain shadow-free imagery, which can be useful for mapping in forested and urban areas where strong shadows can obscure surface detail. Other advantages include the fact that UAVs can be easily mobilized for frequent repeat surveys of rapidly changing areas. UAVs can also be applied where safety is a concern, such as when monitoring forest fires or overflying volcanic regions. In these cases a UAV survey may be carried out without risking the lives of flight crew members. Despite these advantages, UAV-based photogrammetry has been relatively slow to catch on in North America. Numerous reasons exist for this, but the main stumbling block is the present regulatory environment. It is particularly at issue in the United States where current Federal Aviation Authority (FAA) rules make civilian use of UAVs almost impossible. This situation may change over the next two to three years, as the FAA is currently drafting preliminary rules governing UAV use in U.S. airspace. In Canada, the picture is somewhat brighter. Under Transport Canada regulations, individual provinces may issue a Special Flight Operation Certificate (SFOC) that permits the operator to carry out a UAV survey provided the aircraft remains in sight at all times. In both jurisdictions, there is a move to integrate UAVs into civilian airspace, although it is likely that full integration will occur only with the development of reliable collision-avoidance systems. While there is no such thing as a typical job, most projects tend to follow a series of similar steps. On arrival at the site, one of the crew members will place targets every 200-300 m across the site. These targets are surveyed using real-time kinematic (RTK) GPS to give an accurate framework of ground control points (GCP). While the survey is being performed, the other member of the field crew plans the flight using in-house Accuas Mission Planner software. With this package, the operator can set the flying height, photo overlap and strip overlap, and the strip orientation. By carrying out flight planning in the field, it is possible to account for unforeseen conditions such as high winds. Once the flight plan is complete, it is uploaded to the aircraft. After preflight checks, the aircraft is launched by hand, and it will then fly the path created in the flight plan. On completion of the survey, the aircraft returns to the takeoff point, at which time the operator takes control and flies it into a net. The log file of the flight and the photos are then immediately downloaded to a laptop computer. Once the data acquisition phase is complete, the job can then be processed. Accuas uses Trimble’s Inpho software for photogrammetric processing. This is a high-end photogrammetric package that can be adapted for UAV surveys. On average, a UAV survey will generate between 100 and 500 photos. Typically, half of these are redundant because surveys are usually flown with a 60% overlap between strips in addition to the standard 60% overlap between photos. Usually this means that every second strip can be omitted from a project. The high overlap is useful in windy conditions, when a lightweight aircraft can be blown off course, and in hilly terrain. Where relief variations are high, the low flying height can potentially lead to large-scale variations between photos as well as gaps in stereo coverage. Under such conditions, the additional strips can be used to fill in gaps in the data. Once the project has been set up, triangulation and block adjustment are carried out to establish the full set of orientation parameters for each photo. At this stage, many manual tie points are still required as initial input to the triangulation process. Using the measured position of GCPs, as well as manual tie points and initial estimates of the camera orientation parameters from the log file, a series of automated tie points is generated. These points allow accurate values to be calculated for camera orientations using a rigorous bundle block adjustment procedure. A good triangulation is a necessary first step to get accurate elevation models and orthophotos. In the future, improvements in the quality of camera orientation measurements recorded in the log file are expected to reduce the need for manual tie points. Following triangulation, a digital terrain model (DTM) is normally generated for the job. DTMs generally have a smoothing effect, with buildings and small clusters of trees being filtered out. In general, a DTM will produce a smoother-looking orthophoto than a true surface model (DSM), which will often have a choppy appearance where there are sudden and abrupt changes in height. Orthophotos are generated from each photo using the DTM, and the individual orthophotos are then combined to produce an orthophoto mosaic, typically with a resolution of between 5 and 10 cm. For volumetric surveys, a full surface model is usually generated. This is more time consuming, but the surface representation is usually more accurate than can be achieved using a DTM. Areas of interest such as individual stockpiles are identified, and the surface model is manually edited within these areas to remove unwanted features such as conveyors and buildings. The areas of interest and the edited surface model can then be exported, and volumes can be generated using 3D modelling software. Several jobs have included independent check points to verify horizontal and vertical accuracies. In such cases, the number of surveyed points is increased, and half the points are converted to check points. Accuracies obviously vary depending on local conditions, but for most jobs, root-mean-square (RMS) accuracies are better than 15 cm in X and Y and 20 cm in Z, which means that 50-cm contours can be produced at better than 95% reliability across the entire jobsite. Relative accuracies for volumetric surveys are considerably higher (for example, when calculating stockpile volumes). Accuas has completed a variety of projects for different clients. One application for which UAV surveys have proved particularly cost effective is in surveying aggregate pits. Last summer, the company carried out a series of photo surveys for a large aggregate company based in Western Canada. The largest of these jobs covered 4 km2 (roughly 1.5 square miles), and a total of 439 photos were obtained, 200 of which were used in the analysis. The photos were acquired in three separate flights because battery life was insufficient to cover the whole area in a single flight. For this job, 42 GCPs were surveyed, of which half were used as check points. Processing of this job took approximately one day. Following triangulation, a 10-cm orthophoto was generated covering the entire site. A full DTM and DSM were created and stockpile boundaries demarcated using Inpho. The DSM within the stockpile boundaries was then edited to remove spurious contours generated by conveyors and other machinery. 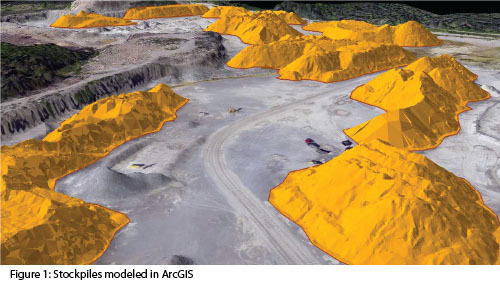 As a final step, the stockpile boundaries and digital surface model were exported, with final pile volumes being calculated using custom developed tools in ESRI’s ArcGIS software (figure 1). UAVs may also offer an ideal way to carry out surveys in remote areas. Last July, I used an Outlander UAV provided by Accuas to carry out unrelated fieldwork in the Canadian Arctic. The objective was to map the terminus region of Fountain Glacier on Bylot Island, which lies at 72° 58’ North, 78° 23’ West. In this case, the major challenge was flight planning. To acquire imagery with the required 10-cm resolution, it was necessary to fly at 300 m above the glacier surface. However, Fountain Glacier is surrounded by high mountains, so any miscalculations could have resulted in losing the aircraft. Another problem was that the surface elevation of the glacier varied by 180 m over the terminus region. This variation represented more than half the flying height and would have resulted in major scale variations as well as the probable loss of stereo coverage over the high areas closest to the camera. The solution adopted was to orient the flight lines crosswise over the glacier, with the aircraft dropping by 12 m (40 feet) at the end of each flight line. By following this approach, it was possible to fly the terminus region of the glacier in 15 strips while keeping scale variations to a minimum. In total, 148 photos were gathered, and these were processed using Inpho to produce a detailed 1-m surface model of the glacier as well as a highly detailed 10-cm orthophoto. This level of detail is unprecedented in glaciological studies and opens numerous new research possibilities. The company has completed a wide variety of other jobs, including monitoring landfills, slope surveys for highway applications, and studies of vineyard health using false color infrared imagery. One of the more unusual applications was to fly the Adams River salmon run in October 2010. Every four years sees a major return of sockeye salmon to the river in southern British Columbia. The 2010 run was the largest in 100 years, with an estimated six million salmon returning to the river over a one-month period. Figure 2 shows the mosaic generated from this overflight. The salmon can be seen as dark reddish lines along either side of the river (the inset shows this image at full resolution). The large reddish areas are groups of thousands of salmon waiting their turn to spawn. The individual spawning salmon may be seen as regularly spaced dots adjacent to the large clusters. This illustrates the resolution that can be routinely achieved using a low-flying UAV. UAV surveys offer a viable alternative for mapping areas too small for traditional aerial photogrammetry to be cost effective. The use of UAVs can therefore extend the photogrammetric process into applications that have traditionally relied on ground data collection. The ability to gather and process data rapidly in a variety of weather conditions and the dense point grids that can be collected during such surveys make UAVs particularly useful for applications involving repeat volumetric surveys. The high spatial resolution and relatively low cost also creates a range of potential new applications for repeat monitoring and research support. While regulatory hurdles are currently slowing the growth of civilian UAV applications in North America, it appears likely that this sector will become increasingly important over the next few years as UAVs are integrated into civilian airspace. Through a new strategic partnership, Accuas will be rolling out the next generation of Unmanned Aerial Surveying (UAS) UAVs in 2011 and seeking serious worldwide franchisees/operators. For more information contact Accuas at info@accuas.ca. Accuas, a company using unmanned aerial system technology for data acquisition services and geospatial solutions in British Columbia, Canada. © 2019 by Flatdog Media, Inc. Articles may not be reproduced, in whole or in part, without prior authorization from Flatdog Media, Inc.